In just a few minutes, you can feel the joy of finding the right size TV for your space, and get it in time for the holidays. How would anyone figure it out? You’d start by measuring your furniture, then take a measuring tape into your local electronics retailer to measure their TVs to size them up and find the best match? That sounds ridiculous, and I’ve never seen any customer use a measuring tape on TVs before, have you? (I wouldn’t doubt it’s happened before though). That means a lot of people just make a guess or buy a smaller TV to be on the safe side, like I did. The biggest regret people have after buying a TV, is that they didn’t buy a BIG enough screen. If only people knew the right size to buy to maximize their screen space, stand space, and viewing comfort, they’d be able to buy the right size the first time, from home, rather than having to take their measuring tape into a retail store and have people look at them funny. A bigger screen size will look better from a further range of distances, like from a couch or a bed. Yet for those of us with cabinets, the maximum size of TV we can get is constrained by the width of the furniture it’ll fit in, and the base it’ll stand on. Is this anyone’s idea of enjoying their new TV? No! Could manufacturers and retailers do more to prevent negative outcomes like this? Yes! By simply providing the information we need to make an informed buying decision and easy way to use this information. I wondered if there were a better way to figure out the max TV screen size that could fit in my cabinet, and the right leg/stand width to fit on my slide out TV stand, in combination, easily, from the convenience of home. And by solving my own problem, I also wondered how I could solve it for everyone else too. Do you see how I could fit a much larger screen size in the opening width? If the stand were about the same width, yet with a bigger screen, that should work. I wondered if there were other BRANDS that has different leg/stand widths that could accommodate my furniture’s sizings? I got curious and spent time figuring it out. We know for example that HDTVs have a 16:9 ratio (width to height), with about a 1″ bezel (frame). 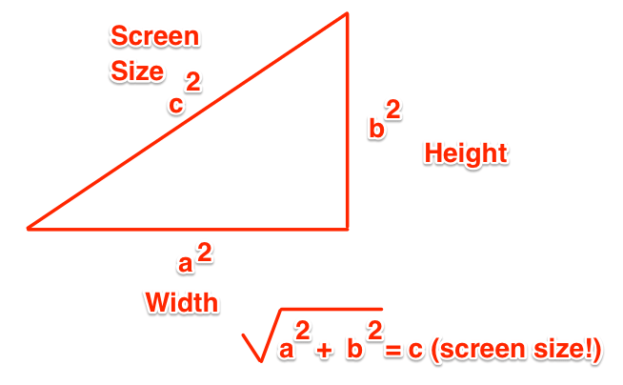 By calculating the opening width, we can determine the max height of the TV (width x 9/16), as well as the diagonal screen size, by using the Pythagorean theorem (Wait a sec… school math is actually useful in the real world?! Yes it is! How cool is it to use it for buying a TV! :D). That determines the total diagonal screen size. Then we subtract 1 (inch) for the bezel (frame), and round to arrive at the max screen size class (which is what manufacturer’s use) that’s right for you! By my calculations, I can upgrade from a 32″ to a larger 39″ screen TV! 🙂 That’s a 22% bigger TV, and the cost difference is just $50!! Without having to buy a larger piece of furniture! You can figure this out for your furniture, and find TVs that match your calculations, on the next page too! Never before have we been able to search or filter TVs by Screen Width or Leg/Stand Width to find the right fit for our furniture, despite many buyers publicly stating their frustration and need for this! This creates friction in being able to confidently buy a TV. Rather than make a mess with a guess, order then return, deal with return S&H or an open box fee, we’ve figured out the leg/stand widths, added them to the current TV models, and provided it in a searchable store format. How to Find the Biggest TV that'll Fit in Your Entertainment Center? An up-to-date database of 350 TV widths and leg/stand widths. These are frustratingly not searchable or not found on retailer’s websites! 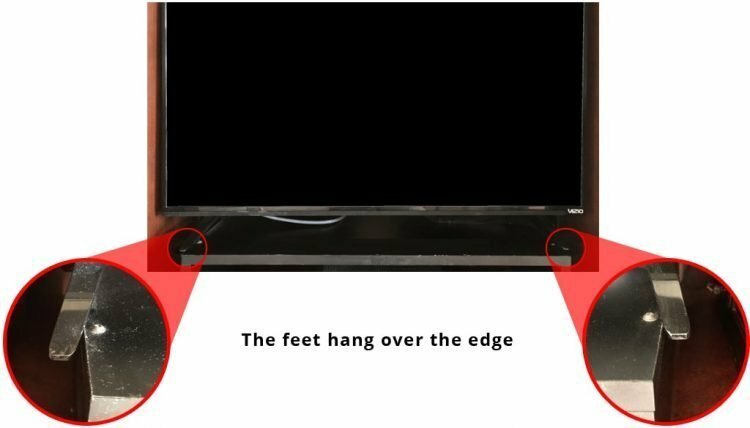 These two widths are important to know to find the correct TV size to fit in a limited opening area and stand width of your TV furniture. People often ask in the Q&As on retailer’s websites how wide the TV legs/stands are, but information often is DIFFERENT by respondent. Sometimes, manufacturer’s reps say to call them, rather than just provide the stand width. Or, often provide missing or incorrect even in the manufacturer’s own spec sheets. Just look at this, how could they not know the stand width when they’ve already manufactured it and are selling it?! We’ve taken a 3-step approach to getting you the right leg/stand widths AND provided them in an easy to search way across ALL manufacturers and the top retailers! How we determined a TV's leg/stand width? Calculated the remainder based on the leg/stand width pixel percentage of the known TV width to come up with an approximation. We then put these widths into this website’s database so you can filter to find your best TV match! Now that you’re ready to head on over to try it all out, go to tv size calculator or filter tvs and choose the right one from our database.